Peak baggers take note: Jackson County, North Carolina is home to some of the highest mountains in the Eastern United States. But the best part? There are trails and summits for everyone from the most novice of hikers and families with small children to endurance athletes looking to log some serious mileage on the trail. Find your panoramic perspective in Jackson County with our list of the top summit hikes in the region. It’s tough to find a hike that’s both family-friendly and steep, but that’s exactly what Waterrock Knob offers. The trailhead is right off the Blue Ridge Parkway at milepost 451.2, and even the parking lot offers expansive views across the Plott Balsam Mountains all the way to the Smokies. As if that’s not enough, you’ll also find picnic tables, restrooms, and a National Park Service souvenir shop just a few steps from your car. But the real reward is the 360-degree views as far as the eye can see up the short and steep trail. At 6,292 feet, Waterrock Knob is one of the 20 highest peaks in the Eastern US. The 1.2-mile out-and-back trail gains 412 feet in elevation and, while always spectacular, the peak is particularly awe-inspiring at sunrise and sunset. One of the most unique hiking experiences in the Southeast is trekking across the treeless and wind-swept North Carolina balds, and the Black Balsam Trail is one of the shortest and easiest ways to do that. Trek just one mile out-and-back from milepost 420 on the Blue Ridge Parkway, breaking out of the tree cover at a half-mile at 6,000 feet for expansive views. 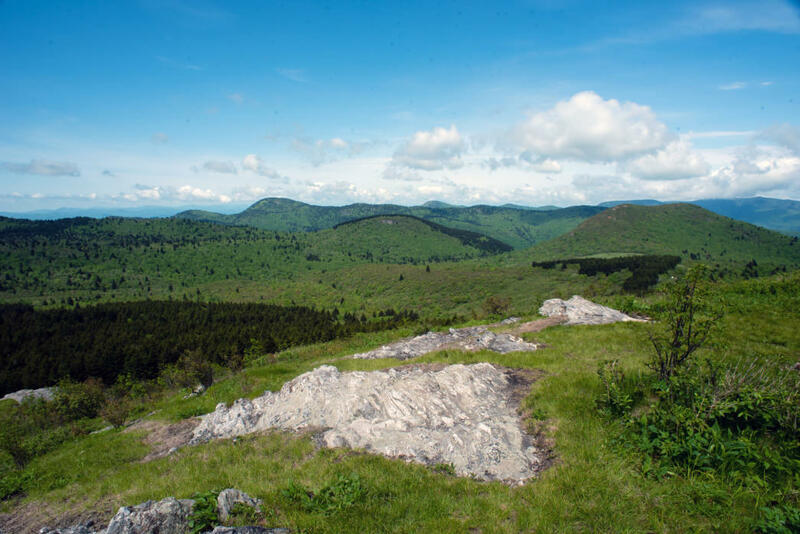 Gaining approximately 300 feet in elevation to Black Balsam Knob, you have the choice of turning back to the trailhead or continuing along the Art Loeb Trail through open meadows to cross Tennent Mountain to the Ivestor Gap Trail for a five-mile loop. Summer is the ideal time to enjoy the aromatic spruce trees and cool temperatures at 6,410 feet along the Richland Balsam Trail. Starting out with spectacular views and high alpine vegetation at the Haywood-Jackson Overlook, you’ll gain 700 feet in elevation as the trail loops 1.5 miles to the summit and back. Be sure to stop about 0.3 miles down the road to snap a selfie at the sign marking the highest point on the entire 469-mile Blue Ridge Parkway. The hike along the Pinnacle Park Trail is challenging, but it’s worth it for these views. If you’re looking for a cardio challenge with bird’s-eye views over Sylva and the Nantahala National Forest, the Pinnacle Park Trail is the hike for you. The 7-mile lollipop loop starts out with a steep and rocky climb. Take a break on the short East Fork spur trail to enjoy the waterfall at Fisher Creek, then make the final push along Pinnacle Ridge on a wide and rocky roadbed for a total of 2,900 feet of elevation gain. It’ll be hard to tell if it’s the sheer cliffs and dramatic summit views or the climb to the top that takes your breath away. For one of Jackson County’s toughest and most spectacular hikes when it comes to distance, elevation, and views, take the Yellow Mountain Trail. This out-and-back roller coaster trek of 12 miles climbs up and over Cole Mountain, Goat Knob, Shortoff Mountain, and Yellow Mountain. Uninterrupted views in all directions from the Yellow Mountain fire tower are an unexpected reward at the turnaround point. The tower, built in 1934, provides an ideal vantage point across four states and the Smokies and the Plott Balsam, Nantahala, Cowee, and Great Balsam Mountains. Nestled between the quaint post-hike destinations of Cashiers and Highlands, the 2-mile Whiteside Mountain Trail rises almost 5,000 feet to the top of the highest vertical cliffs in the Eastern US. Soak in the near-360-degree views, keeping an eye out in spring and summer for nesting peregrine falcons. The rest of the year, you’re more likely to spy climbers scaling the stark white, 750-foot cliffs. Hike the trail clockwise for a moderate climb to the top, or counterclockwise for rock steps leading to a more strenuous ascent. Panthertown Valley’s 6,000-plus acres of pristine backcountry terrain puts this hiking destination in a category of its own. Topping out at a little over 4,000 feet, what Panthertown lacks in elevation it makes up for in rugged and sweeping vistas. Over 30 miles of trails and old logging roads have earned this area the nickname “Yosemite of the East,” with routes crisscrossing creeks, waterfalls, mountain bogs, deep gorges, and granite peaks for everything from easy half-day hikes to challenging multi-day backpacking trips. A 5-mile loop to Little Green Mountain’s Tranquility Point offers serene views across the Nantahala National Forest. Take a short, quarter-mile walk to views at Salt Rock Gap, or continue hiking to the summit of Big Green Mountain for a panoramic perspective on the valley. Hit the Blackrock Trail for a moderate 3-mile loop to Blackrock’s summit at 4,200 feet. One of Panthertown Valley’s most unique features is the rounded granite domes bulging from the valley floor. These monoliths, called plutons, merely hint at the massive plume of cooled and solidified magma lying under the earth’s surface. The trek to the peak of Blackrock Mountain allows you to examine one of these sheer rock faces up close before summiting for 180-degree views of Panthertown’s most notable plutons, Big Green and Little Green. Start at the Salt Rock Gap trailhead near Cashiers for a moderate 3-mile loop to Blackrock’s summit at 4,200 feet. 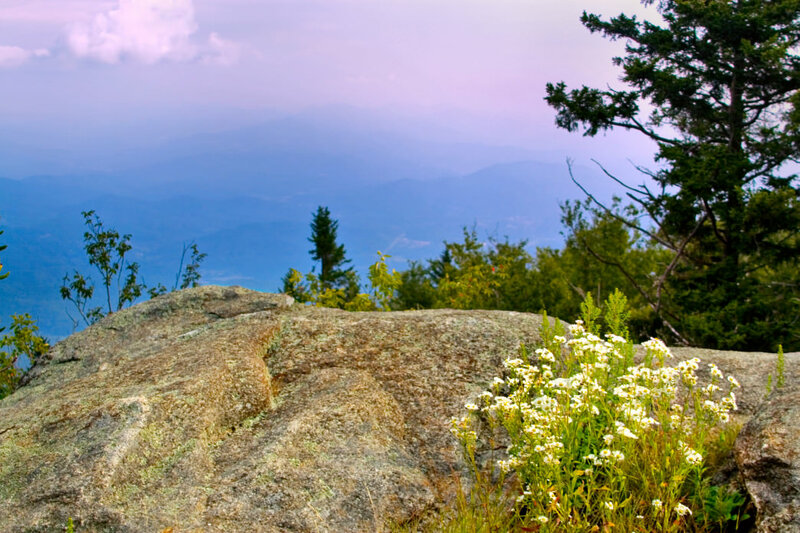 Wide trails through mixed hardwood forest and thick mountain laurel and rhododendron tunnels break out on a series of rock ledges near the top for southeastern panoramas across Panthertown Valley and northeastern vistas across the Blue Ridge.